Aitutaki Escape is luxury Aitutaki accommodation set in the most magical part of the Cook Islands on the Aitutaki Lagoon. This stunning beachfront resort prides itself on attention to detail and personal service, ensuring its guests a completely luxurious retreat. The beachfront villa accommodation at Aitutaki Escape feature all the necessities as well as those little extra luxuries. Each villa is totally private and tranquil and features a private swimming pool, outdoor heated spa and deck all surrounded by beautiful gardens. Inside, the villas is spacious and fully equipped with all the facilities guests require, including kitchen, ensuite, four poster king bed, dining and living area. The ocean views from each villa will take your breath away at this Aitutaki accommodation. Aitutaki Escape offers a range of complimentary facilities including use of bicycles to explore the local area, the use of kayaks and snorkeling equipment to explore the beautiful lagoon waters. Guests can choose to do as little or as much as they desire with all their needs taken care of with the helpful concierge service. 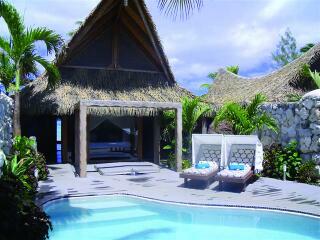 For those looking for a truly relaxing and pampered romantic getaway destination Aitutaki Escape is not to be missed. This enchanting Aitutaki accommodation is a must see on your next Cook Islands holiday itinerary. Aitutaki Escape offers luxury beachfront villas ensuring guests the most tranquil and rejuvenating Aitutaki accommodation. Each villa features a cool tropical design and the large glass windows allow guests to surround themselves with the amazing ocean views and tropical gardens. One Bedroom Beachfront Villa: Watch the sunset from your private beachfront deck or take a dip in your private swimming pool. These villas also feature a spacious double basin ensuite bathroom. Room size is 96m². Two Bedroom Ultimate Beachfront Villa: Enjoy the beach views from the Master Bedroom and garden & pool views from the second bedroom. This spacious villa is ideal for two couples travelling together or for those wanting extra space on their romantic getaway. Aitutaki Escape offers two different wedding packages in a number of locations which include your own personal wedding coordinator, flowers and more. There is no more a romantic destination for your special day than the Aitutaki Lagoon, so why not be pampered and taken care of at Aitutaki Escape.